I am a marine and environmental geochemist who does cross-disciplinary research between coastal oceanography, hydrogeology, and environmental radiochemistry. I combine both geochemical and geophysical tools to answer scientific questions related to my research interests in areas under contrasting morphologic and climatic regimes. Some of my previous experience includes studies of groundwater-surface water interactions in fresh and marine environments in karstic (Florida) and sandy aquifers (San Francisco Bay, California), volcanic areas (Big Island and Oahu, Hawaii),and arctic regions with various permafrost coverage in Alaska. (3) Studying occurrence of natural and artificial radioactivity from radioprotection point of view. Past research projects include the monitoring of natural radioactive contaminations in drinking water, soil, and other natural materials. An important part of my research has been developing new methods and applications using naturally occurring and man-made radioisotopes. I plan to continue pursuing the radioisotope research and expand the list of radionuclides for new hydrological and geological applications. Biogeochemical transformations of nitrogen speciations in organic-rich sediments from Mobile Bay, AL. C.-.Chien, B.Allen, N.T.Dimova, et al. (2019). Evaluation of atmospheric dry deposition as a source of nutrients and trace metals to Lake Tahoe,Chemical Geology, https://doi.org/10.1016/j.chemgeo.2019.02.005. Wilson, R.M., L. Fitzhugh, G. Whiting, S. Frolking, M.D. Harrison, N. Dimova, W.C. Burnett and J.P. Chanton (2017). Greenhouse gas balance over thaw-freeze cycles in discontinuous zone permafrost, Journal of Geophysical Research – Biogeoscience, 122, doi: 10.1002/2016JG003600. Kodovska Garcia-Tigreros, F., K. J. Sparrow, S. A. Yvon-Lewis, A. Paytan, N. T. Dimova, A. Lecher, J. D. Kessler (2016). Dissolved Methane and Carbon Dioxide Fluxes in Subarctic and Arctic Regions: Assessing Measurement Techniques and Spatial Gradients, Earth and Planetary Science Letters (EPSL), 436: 43-55. Xu, B., T. Bianchi, M. Allison; N. Dimova; H. W.; L. Zhang; S. Diao; X. Jiang; Yu Zhen; P. Yao; H. Chen; Q. Y; W. Dong; J. Sui; Z. Yu (2015). Using multi-radiotracer techniques to better understand sedimentary dynamics of reworked muds in the Changjiang River Estuary and inner shelf of East China Sea, Marine Geology, 370: 76-86. Dimova, N., Paytan, A., Kessler, J. D., Sparrow, K. J., Kodovska, F. G-T., Lecher, A., L., Murry, J., and Tulaczyk, S. (2015). Current magnitude and mechanisms of groundwater discharge in the Arctic: a case study from Alaska, Environmental Science and Technology, DOI: 10.1021/acs.est.5b02215. Paytan, A., Lecher, A., L., Dimova, N., Sparrow, K. J., Kodovska, F. G-T., Murry, J., Tulaczyk, S., and Kessler, J. D. (2015). Methane transport from the active layer to lakes in the Arctic using Toolik Lake, Alaska as a case study., Proceedings of National Academy of Sciences, doi/10.1073/pnas.1417392112. Xu, Bo-Chao, W. C. Burnett, N. T. Dimova, G. Liu, T. Mi, Z. Yu (2013), Hydrodynamics in the Yellow River Estuary via radium isotopes: ecological perspectives, Continental Shelf Research, doi.org/10.1016/j.csr.2013.06.018. Xu, Bo-Chao, N. T. Dimova, L. Zhao, X-Y. Jiang, and Z.-G. Yu (2013), Determination of water ages and flushing rates using short-lived radium isotopes in large estuarine system, the Yangtze River Estuary, China, Estuarine, Coastal and Shelf Science, 121-122, 61–68. Null, Kimberly A., N.T. Dimova, K.L. Knee, B.K. Esser, P.W. Swarzenski, M.J. Singleton, and A. Paytan (2012), Submarine groundwater discharge-derived nutrient loads to San Francisco Bay: implications to future ecosystem changes, Estuaries and Coasts, doi 10.1007/s12237-012-9526-7. Burnett, W. C., and N. Dimova (2012), A radon-based mass balance model for assessing groundwater inflows to lakes, Chapter 6 in The Dilemma of Boundaries: Toward a New Concept of Catchment, Global Environmental Studies, M. Taniguchi and T. Shiraiwa (eds. ), pp. 55-66, Springer Japan, DOI 10.1007/978-4-431-54035-9_6. Swarzenski, P.W., C.D. Storlazzi, M.K. Presto, A. E. Gibbs, C.G. Smith, N.T. Dimova, M.L. Dailer, and J.B. Logan, (2012), Nearshore morphology, benthic structure, hydrodynamics, and coastal groundwater discharge near Kahekili Beach Park, Maui, Hawaii: U.S. Geological Survey Open-File Report 2012–1166, 34 p.
Smith, C.G., P.W. Swarzenski, N.T. Dimova, J. Zhang, (2011), Natural radium and radon tracers to quantify water exchange and movement in reservoirs, in Handbook of Environmental Isotope Geochemistry, Series: Advances in Geochemistry, vol.1, edited by Mark Baskaran, pp. 345-365, Springer, doi 10.1007/978-3-642-10637-8. Dimova, N.T., W.C. Burnett, K. Speer (2011), A natural tracer investigation of the hydrological regime of Spring Creek Springs, the largest submarine spring system in Florida. Continental Shelf Research,31, 731-738. Dimova, N.T. and W.C. Burnett (2011), Evaluation of groundwater discharge into small lakes based on the temporal distribution of radon-222, Limnology and Oceanography, 56 (2), 486–494. Mwashote B., W.C Burnett, J. Chanton, I.R Santos, N. Dimova, and P.W. Swarzenski (2010), Calibration and use of continuous heat-type automated seepage meters for submarine groundwater discharge measurements, Estuarine Coastal Shelf Science, 87, 1-10. Dimova, N., W.C.Burnett, and D. Lane-Smith (2009), Improvements in the automated analyses of radon (222Rn) and thoron (220Rn) in water, Environmental Science and Technology, 43 (22), 8599-8603. Peterson, R., W.C.Burnett, N. Dimova, and I.R. Santos (2009), A comparison of measurement methods for radium-226 on manganese fiber. Limnology and Oceanography: Methods, 7, 196-205. Santos, I.R., N. Dimova, W.C.Burnett, J. Chanton, B. Mwashote, and R. Peterson (2009), An extended time series for the groundwater tracers 222Rn and CH4 at a coastal site in the Gulf of Mexico, Marine Chemistry, 113, 137-147. Santos, I.R., W.C.Burnett; J. Chanton, N. Dimova, and R. Peterson (2009), Land or ocean? Assessing the driving forces of submarine groundwater discharge, Journal of Geophysical Research, 114, C04012, doi: 10.1029/2008JC005038. Dimova, N., H. Dulaiova, G. Kim, and W.C. Burnett (2008),Uncertainties in the preparation of 224Ra Mn fiber standards. Marine Chemistry, 109 (3), 220-225. Burnett,W.C., N. Dimova, H. Dulaiova, D. Lane-Smith, B. Parsa, and Z. Szabo (2007), Measuring thoron (220Rn) in natural waters, in “Environmental Radiochemical Analysis III”, edited by P. Warwick, pp. 24-37, Royal Society of Chemistry, RSC Publishing, Cambridge. Dimova, N., W.C. Burnett, E.P. Horwitz, and D.L. Smith (2007), Automated measurement of 224Ra and226Ra in water, Applied Radiation and Isotopes, 65, 428–434. Swarzenski, P. W., W.C. Burnett, W.J. Greenwood, B. Herut, R. Peterson, N. Dimova, Y. Shalem, Y.Yechieli, Y.Weinstein (2006), Combined time-series resistivity and geochemical tracer techniques to examine submarine groundwater discharge at Dor Beach, Israel, Geophysical Research Letters, 33, L24405, doi:10.1029/2006GL028282. 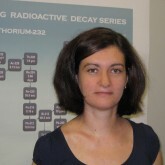 Dimova N., B. Veleva, L. Kinova (2005), Radium isotope determination in rock samples using alpha spectrometry. University of Mining and Geology “St. Ivan Rilski” Annual reports. Dimova N., L. Kinova, B. Veleva, B. Slavchev (2003), Radiochemical procedures for determination of naturally occurring uranium isotopes in environmental samples. 50 years University of Mining and Geology “St. Ivan Rilski”, Annual reports, vol. 46, part І, Geology and Geophysics, Sofia: 241-246.